Our community has been buzzing with questions, concerns, and near panic about future of SL after Ebbe Linden recently announced that Linden Labs was working on a new project. The announcement was vague, but many of us feared that SL would be shut down when the new project came online. Jessica Lyon, Project Manager of the Phoenix Firestorm Project, was understandably concerned since the news included a statement that 3rd party viewers would not be allowed in the new product. But instead of merely worrying, Lyon took a couple of positive steps to address the issue. On the Firestorm website (www.firestormviewer.org) she asked users to send in suggestions for ways to improve SL and increase its usage. She also set up a meeting with representatives from Linden Labs to discuss the future of SL. 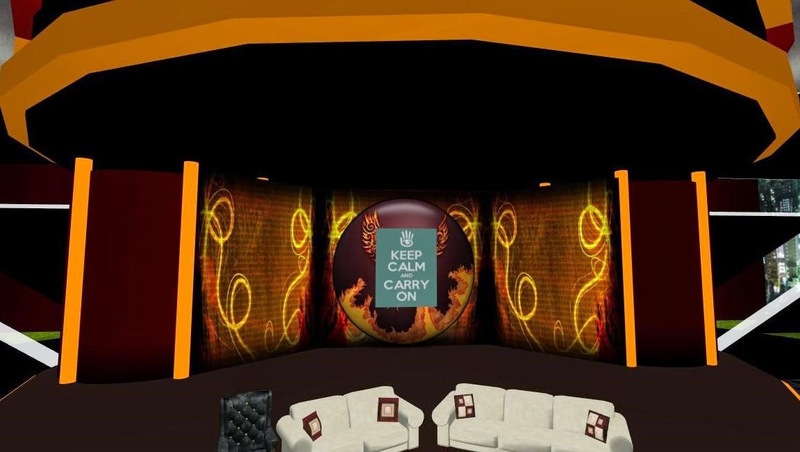 The meeting was to be broadcast live at 7AM SL time on July 2 from the Firestorm Support Auditorium at The Phoenix Hour, Phoenix Firestorm Support (170, 127, 4001). The announcement suggested that interested residents should show up early since space was limited. I logged on about 6:15 SL time and tried to teleport to the auditorium. I rarely go to RL meetings 45 minutes in advance so I thought I had allowed more than sufficient time. I was wrong. The site was already filled to capacity. I later found out that it had filled up at 5:30! Quickly I logged out and went to watch a live broadcast of the meeting that was being aired at Virtual Worlds & Immersive Spaces. Lyon had succeeded in getting Oz Linden, Technical Director of SL, and Peter Linden, Director of Communications at SL, to meet and answer questions from her and residents. On the stage was a large sign that read: Keep Calm and Carry On. Lyon had been urging residents to do that in the days before the meeting. She began the meeting by asking Oz Linden if SL was going to be dropped. Oz Linden firmly stated that Linden Labs has no plans to shut down Second Life. Lyon asked him this question in a number of different ways, and he consistently answered that there are no plans to do away with SL. Oz stated that they will continue to improve it, and he believes that the criticism and concern that residents are showing is an indication of how much people care about SL. Oz told Lyon that he had lobbied for his current position as Technical Director. He stated that he is doing exactly what he wants to do in SL. He further stressed that he selected individuals for his team that are also committed to SL. Lyon questioned him about the fact that fewer resources are being put toward SL, which is a concern to users. Oz stated that Linden Labs is putting resources toward SL, although he acknowledged that his team is smaller than those in the past. Oz would not get into actual numbers or percentages because he said that was against company policy and the numbers changed frequently. He described it as a “fluid situation”. However, Oz stressed that he had asked for this number of people, and Linden management had given him the team size that he had requested. He said he likes working with a smaller team and mentioned some of the positive aspects of it. When Lyon questioned Peter Linden about the future of SL, he also confirmed that it was going to remain. 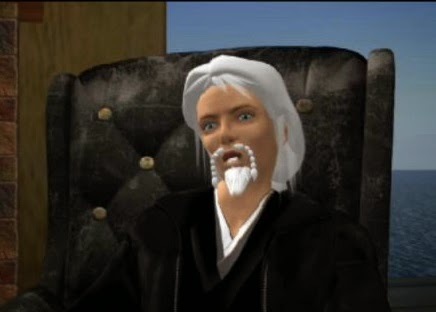 It was pointed out that SL is the most successful virtual world ever created. Because of that he says everyone can be confident that it will continue. When asked about the new platform, Peter said the idea is to have them run in parallel. He also stressed that the new platform is “quite far off”. Because of that he said it was too early to talk about it in any detail. But he again stressed that there were no plans to shut down SL. Lyon and Oz then discussed many of the projects his team is working on to improve SL. The primary projects were technical ones involving scripting and group chat improvements. Oz said an announcement would be made later in the day about one of the more prominent issues. The best indication to me that the Lindens are going to continue SL involved Oz’s discussion of working on a project involving Chrome imbedded framework issues. He said they are devoting a lot of time and money to take advantage of advances involving Chrome. He pointed out that if there were plans to end SL, they would not do this. They would simply “limp along” with what they have, which makes sense to me. The questions from residents involved tier, child avatars, gaming, group size, the search engine, and last names. Predictably, there are no plans to reduce tier or change the policies on child avatars or gambling. Peter said Ebbe knows about the issue of last names, but he didn’t have any other information about it. Oz explained that the issue of group size is more complicated than it seems and affects chat lag and other issues. They are working to reduce chat lag. The search engine also appears to be a complicated issue that is on the “to do” list. The meeting ended with Lyon asking them what residents can do to help SL continue. Oz stated that they are working to reassure people that SL is going to continue. Residents can help by doing what we’ve always done—log in, create content, shop, visit with our friends, and keep SL a “vibrant place”. They also urged residents to tell their RL friends about SL and urge them to check it out. The sign on the stage said it all: "Keep Calm and Carry On." ROBLOX is powered by a growing membership base of over 300,000 creator players who produce an infinite variety of highly immersive experiences. These experiences range from 3D multi-player games and contests, to interactive adventures where players can take on new avatars to discover what it would be like to be a dinosaur, a miner working a mine or an astronaut out in space.